Butchertown takes its name from its 19th century roots as a meat packing center. Just east of downtown Louisville, Butchertown is bounded by I-65, Main Street, I-71, Beargrass Creek and Mellwood Ave. Its proximity to a major turnpike (now Frankfort and Story avenues) and the creek was what made it an ideal location for meat packing in its early days, as butchering was banned from the central city. JBS/Swift, the last remaining meat processing plant, remains in Butchertown and is both a major employer and a source of dissension to the many upscale residents who now live there. The residential character of the area was nearly destroyed by the construction of the Ohio River flood wall, interstates, and expanding industry. The remaining residents lobbied for rezoning to keep their homes. Attracted by the interesting architecture in the neighborhood, young professional rediscovered Butchertown in the 1990s and work along working class residents to keep it strong. Now antique shops, restaurants, art galleries, and boutiques offering unique and interesting pottery, wall art, jewelry, and sculptures have opened along Market Street and draw patrons from all over Louisville. 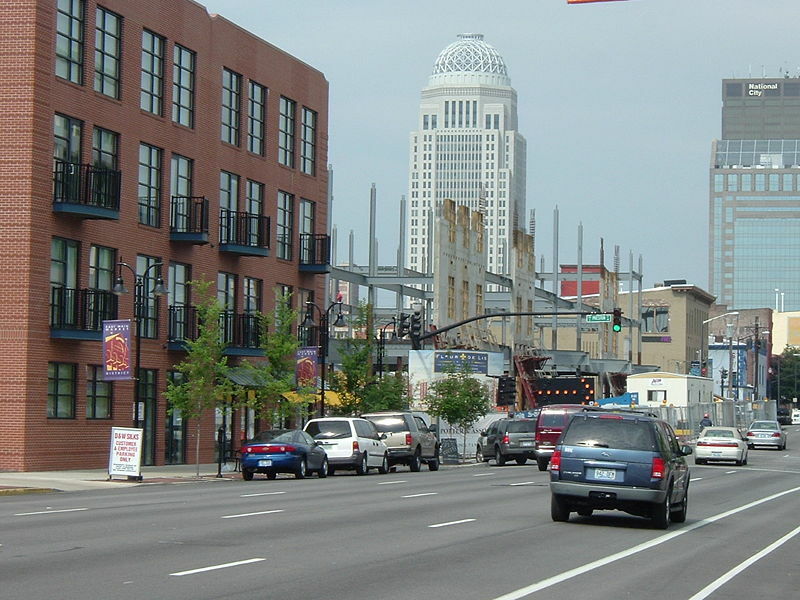 Now that downtown is being revitalized, with developments like NuLu, KFC Yum! Center, and Fourth Street Live, housing in adjacent neighborhoods like Butchertown is in great demand. Old buildings and warehouses are being converted into condos and apartments or refurbished to hold new businesses. Today, Butchertown still smells of pork as old and new residents try to coexist in a sought-after neighborhood. 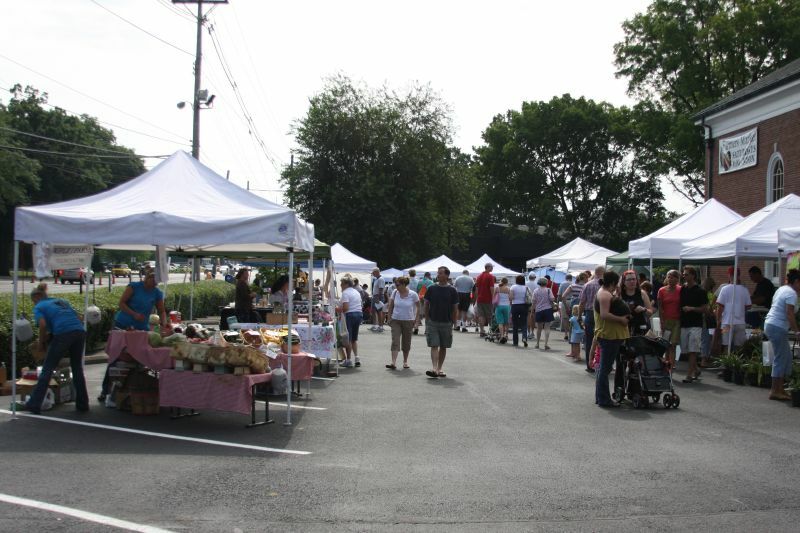 Buthchertown and neighboring Phoenix HIll is part of the trendy East Market District known as NuLu (a portemantwau of of "New" and "Louisvillel"), that runs along Market Street between Downtown to the west and The Highlands neighborhood to east. 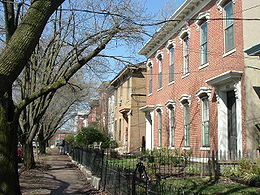 Located four miles east of downtown Louisville, Crescent Hill is one of the oldest areas of Louisville. Modern Crescent Hill boundaries are N Ewing Ave to the St. Matthews city limit (roughly Cannons Lane) by Brownsboro Road to Lexington Road. 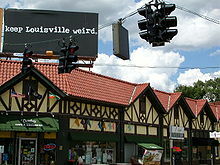 The neighborhood was annexed to Louisville in the late 1800’s. Hometown to about 8,000, it has a small town feel about it. Recently Southern Living Magazine recognized Crescent Hill one of the South’s Best Comeback Neighborhoods! Crescent Hill has historically been known for its ability to come back after disaster. In 1937, residents from downtown Louisville sought refuge here as flood waters rose. The neighborhood was dealt a blow by the great suburban exodus in the 1950’s. In April,1974, Crescent Hill was nearly destroyed as a tornado ravaged the area. But time and again, a strong community spirit pushed them forward. The residents are still very active in their community. They came together to save their local library, improve the park and refurbished the Frankfort Avenue Corridor. In 2009, the suburb celebrated its 125th Anniversary. Neighborhood clubs have taken the lead in keeping Crescent Hill strong. The Crescent Hill Improvement Club (1908), Crescent Hill Forward Club (1914), and later the Crescent Hill Community Club were established to deal with the neighborhood issues and the promoted the spirit of community the area is still known for. Since 1966, the modern day Crescent Hill Community Council continues to promote and improve the community. Today, local shops, restaurants and even artists’ studios are the economic base of the neighborhood. Along the Franklin Avenue Corridor, the motto is Live, Work, and Play! Crescent Hill blends the excitement of city life and the comforts of suburban living right in the heart of Louisville. Downtown Louisville was once a residential center, with streets lined with large mansions of the owners of businesses located on Main and Market streets. Many large homes were converted to multi-family dwelling or businesses, but the population of downtown residents dwindled in the early decades of the 20th century. In Louisville, the mantra is “refurbish, not destroy” when it comes to historic buildings, so after the late 1980s,many old warehouses and factory spaces were converted to loft apartments. Features such as cast iron facades became focal points in renovated buildings. The popularity of these dwellings sparked new construction in the late 1990s and early 2000s. Buildings such as Waterfront Park Place, Fleur de Lis on Main, and Kentucky Towers attracted urban dwelling and made downtown Jefferson County's tenth Multiple Listing Service zone in 2007. The demand for downtown housing was expected to double between 2005 and 2010 to 4,000 units. The recession stifled growth a bit. but new projects abound with developments such as the mixed-use renovation of the Henry Clay building at Third and Chestnut, the Wright-Taylor building that faces Fourth Street and is located behind the Henry Clay, and the mixed use ZirMed Gateway Towers. Other developments underway in downtown should increase housing demand in the next few years. Construction along the Riverwalk Trail, the conversion of the former Big Four railroad bridge into the longest pedestrian only bridge in the U.S., the KFC Yum! Center waterfront arena, and the reconstruction of Spaghetti Junction (the intersection of I-65, I-64 and I-71) along with the addition of a new bridge for northbound I-65 traffic all are expected to entice residents to live downtown. Plan are underway for the $442 million Center City project, which will add 23 acres of housing, restaurants, a cinema, and a boutique hotel to the area bounded by Second, Third and Liberty streets and Muhammad Ali Boulevard. The Cordish Company, which developed 4th Street Live! Is trying to obtain financing and negotiate state and local tax rebate. The boundaries of downtown Louisville are the Ohio River to the north, Hancock to the east, York Street to the south, and 9th Street to the west. Germantown is the an area of Louisville three miles south of downtown bounded by Barrett Ave, Eastern Parkway, and the South Fork of Beargrass Creek. Named for its German immigrant setters, it was originally nicknamed “Frogtown” as the nearby creek overflowed frequently, causing malaria. Once the creek was rerouted into a deeper concrete canal, the area prospered and the area was heavily developed. During the 1890s, the largest collection of shotgun houses in the city of Louisville was built to accommodate hoards of newcomers. These narrow rectangular domestic homes, often no more than 12 feet wide, had doors at each end and little space between them. Shotgun houses, along with a variation called the camelback, which has a partial second floor, still dominate the streets of Germantown today. Originally a blue-collar neighborhood, Germantown is today sought out for its proximity to the entertainment in the pricier Highlands and Old Louisville neighborhoods, but many young families and college students live there, as well as descendants of the original settlers. Like many other historic Louisville neighborhoods, the area is a prime target for urban pioneers who started buying and refurbishing whole blocks and vacant lots in the 1970s when the prices were dirt cheap. Some current "urban homesteaders" maintain gardens, keep beehives, and raise chickens in their backyards. Germantown also refers to the area of Louisville from the Original Highlands to St. Joseph and Bradley neighborhoods that were predominantntly settled by German immigrants in the 19th century. 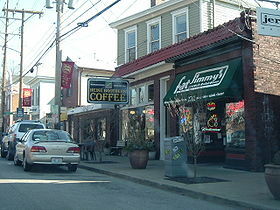 Just eight miles east of downtown Louisville, St. Matthews is a city of nearly 20,000 people. Conveniently located near Louisville's East End and easily accessible from the both Watterson Expressway and I-264, St. Matthews is bounded at the north by several subdivisions off Brownsboro Road (Bellewood, Brownsboro Village, Maryhill Estates and Windy Hills). The cities of Richlawn and Norbourne Estates are enclaves within St. Matthews. Probably best known for its upscale shopping centers, the Mall St. Matthews and Oxmoor Center, the city of St. Matthews has much, much more to offer. In 2007, CNN Money named it a contender for its Top 100 cities to live. 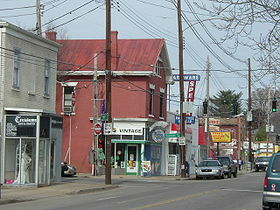 The 20th largest city in Kentucky, St. Matthews had a cost of living index10 below the national average in December, 2009. Today, despite its many modern amenities, the heart of St. Matthews still offers appealing small-town feel. 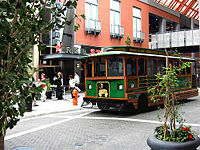 With over 2,000 bars and restaurants within 12 minutes of St. Matthews, the area is a popular entertainment district. For residents looking for a little peace and quiet, Seneca Park - one of the city's largest and most beautiful parks – offers spectacular views and ample spaces for running, dog-walking, or simply quiet contemplation at the beloved Big Rock. In addition to Seneca and several other parks, St. Matthews also has a thriving community center offering recreational sports programming throughout the year. 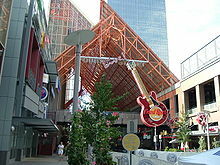 The Highlands is a prime entertainment district in Louisville that begins in the Phoenix Hill neighborhood on Baxter Avenue, continues on as Baxter turns into Bardstown Road right down to the Watterson Expressway, and includes the “original Highlands” on Barret Avenue. With a dense mix of restaurants, bars, nightclubs, and shops along Bardstown Road, the Highlands is often called “The Strip” or ” Restaurant Row.” The intersection of Baxter Avenue and Bardstown Road has Louisville’s target concentration of bars and restaurants. Shoppers are also at home in the Highlands. Everything from antiques to comic books to specialty gifts for every occasion and taste can be found, all on Bardstown Road and most within easy walking distance of one another. From Cave Hill Cemetery (resting place of such notables as explorer George Rogers Clark and KFC founder Colonel Harland Sanders) to the Louisville Zoo, the Highlands is home to an incredible array of parks, sight-seeing, and recreational facilities. Both Bellarmine University and Sullivan University are located in The Highlands. Characterized by unique architecture, The Highlands includes grids of streets line with single-family homes and economic mix ranging from working class to some of the most expensive streets in The Highlands. One expensive street, Spring Drive, is the site of one of Louisville's most famous Derby parties—the Barnstable Brown Party, hosted by Wrigley's Doublemint Twins Cyb and Patricia Barnstable.